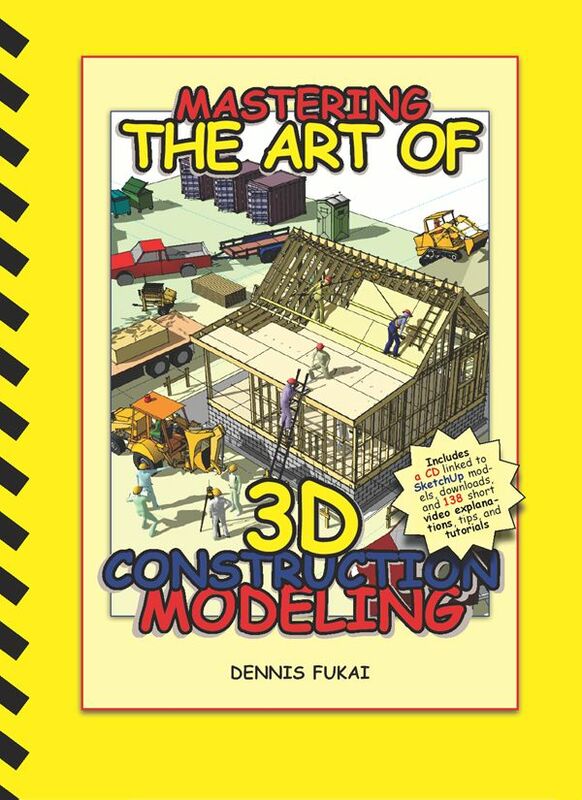 We just finished an update to our classic book, 3D Construction Modeling. The new book was written for project managers who want to learn first hand how to build their own piece based construction models. A construction model is a process model, built to communicate ideas and illustrate details using a deconstructable assembly of accurately scaled groups and components. In other words, a construction model is specifically built to be assembled, disassembled, and staged to communicate the means and methods of a construction. As such, it is not a design tool, it is a communications tool. 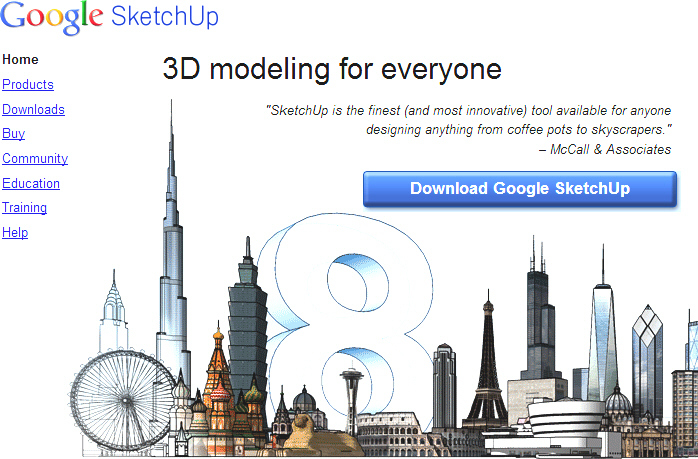 The key to fast and simple construction modeling is an open-source 3D program like Google SketchUp. As advertised, the software is so easy that a child can use it. And though that’s a true statement, most of us know that doesn’t necessarily mean it’ll be easy for a project manager to learn to use the program in the real-world of construction. But all it really takes to master the art of construction modeling are a few tips and tricks, a little practice, and the motivation to put the program to work. 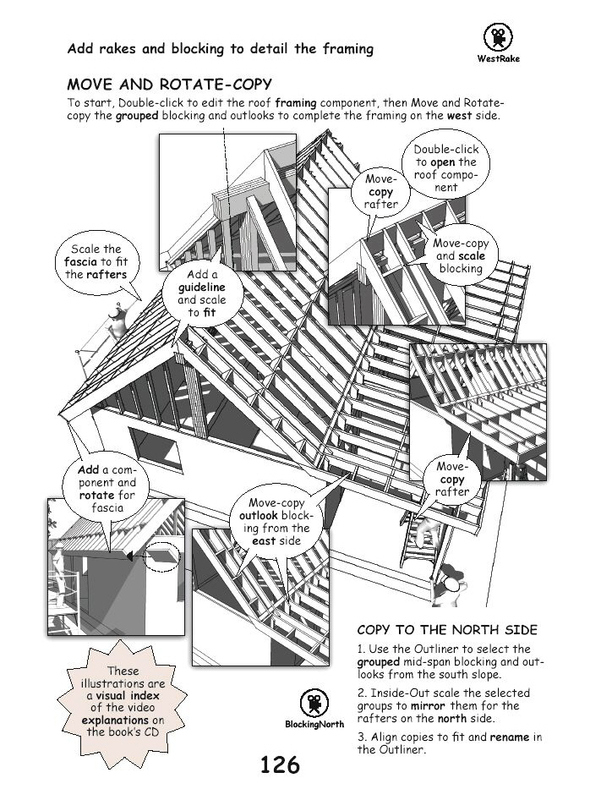 The book blends annotated illustrations, short videos, models, and tips and tricks into a series of graphical indexes. First as a content page that looks a lot like a standard work breakdown structure (WBS) with eight construction phases. The WBS thumbnails link to a series of video indexes on the book’s CD and are included in the book’s table of contents as an overview of each chapter. 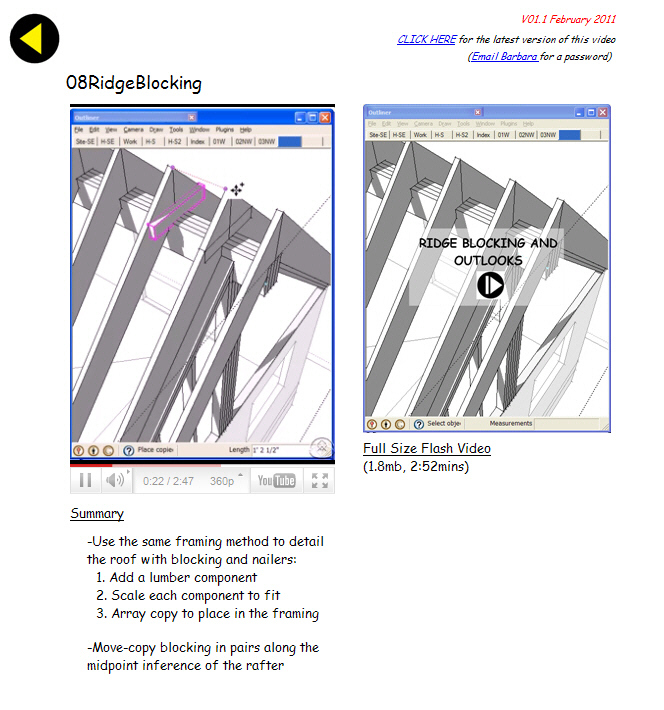 These chapter indexes link to a series of 74 short video explanations of the virtual construction. 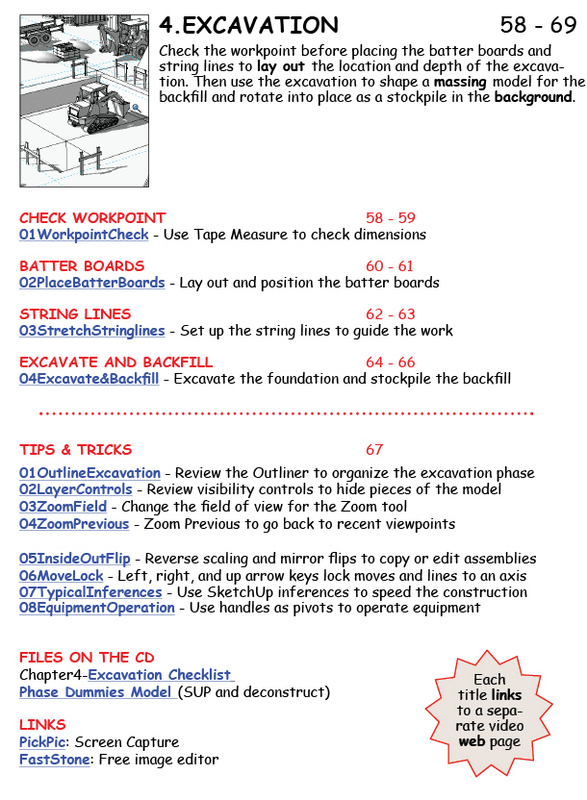 The chapters themselves include 54 quick tips and tricks to support the video tutorials. The tips and tricks are simple techniques that help to speed model construction. The pages of the book act as a graphical index of the tutorials. As such they illustrate the content of each of the video tutorials, introducing techniques that may already be understood, leaving the user to decide the relevance of each step in the modeling method and the corresponding tutorial, based on their experience with the program. The video pages linked from the graphical index on the book’s CD include embedded YouTube links and full size Flash animations that cover the details of the printed illustrations. We include these videos on the CD as pop-ups along with resources and cross references to the programs, tutorials, checklists, models, and files used for each phase of the construction model. The book’s CD also includes all the models used to illustrate the book, plus the Insitebuilders Shortcuts data file, Insitebuilders Template file, and 154 components taken from the much larger Insitebuilders Component Library. The rest of our collection can be found in the models included with our other books (Building SIMPLE, Being SUSTAINABLE, How a House is Built, and How to Plan, Permit, and Pay for a Small Home of Your Own). 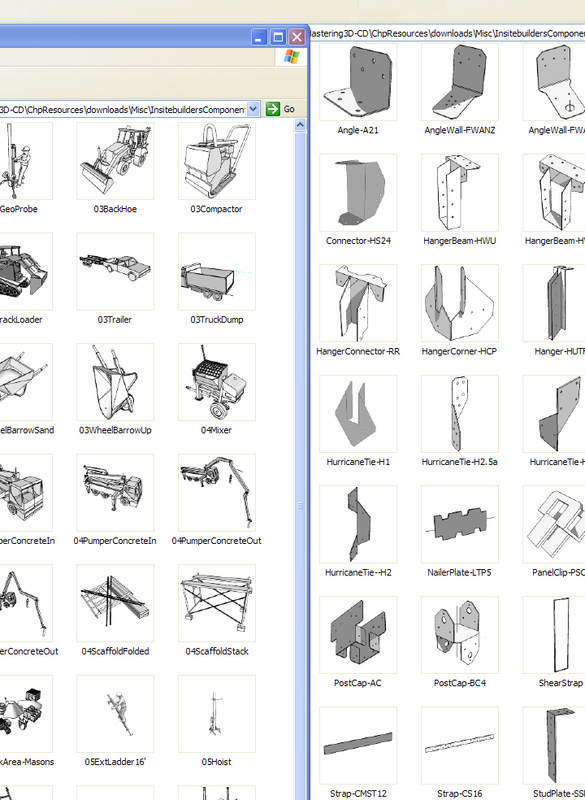 Components are an important part of fast-track construction modeling. No piece of a construction model needs to be built or supply-sourced more than once. Just like the real world, each model draws on the experience and resources that worked on a previous project and every new construction begins with a collection of components that have been built before. This means a construction model is no more than a quick assembly from a known collection of prefabricated parts. The tutorials in this book demonstrate this collective method of modeling using a combination of a fast fabrication technique to build and update new components. This includes a detailed look at the Outliner and how it keeps the pieces of the model organized, making it possible to stage illustrations, organize deconstructions, and animate sequences of production. The Outliner also formats components so that they can be quantified and linked to cloud sourced documents like spreadsheets, slide presentations, and reports. 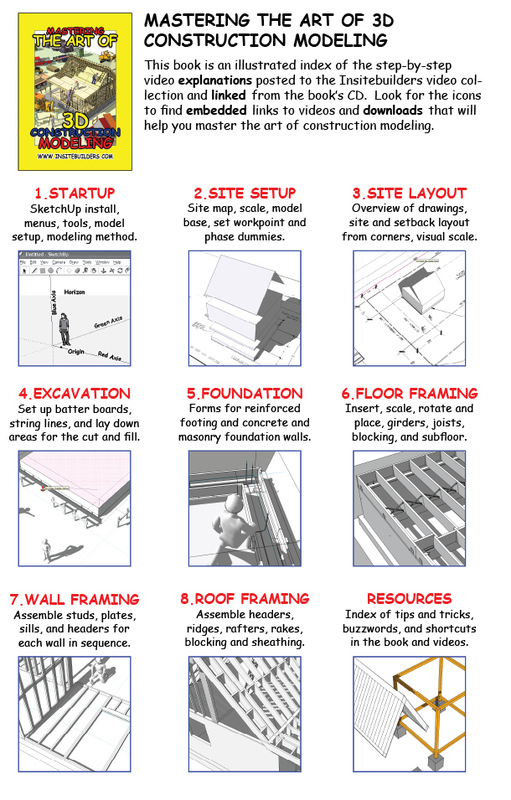 The book therefore mixes digitally printed illustrations and annotated graphics captured from SketchUp, video explanations and sample models, along with YouTube and Flash videos, pop-ups, web pages, checklists, spreadsheets, slide shows, and text based PDFs. Most important, the entire book was produced using a combination of open-source and freely available programs downloaded from a cloud of similar programs, including Google SketchUp, Earth, Maps, Docs, PickPic, KompoZer, VirtualDub, FastStone, PDF Fill, Scribus, and the Wink animator. For more details on all our books, visit our website at www.insitebuilders.com. How much is your book? Working on a community about the size of a city block. I want one. Thanks. John 626-644-0056. OK? Not that I’m complaining, but slow loading instances times will sometimes affect your placement in google and could damage your quality score if ads and marketing with Adwords. Well I am adding this RSS to my e-mail and could look out for much more of your respective fascinating content. Make sure you update this again very soon.